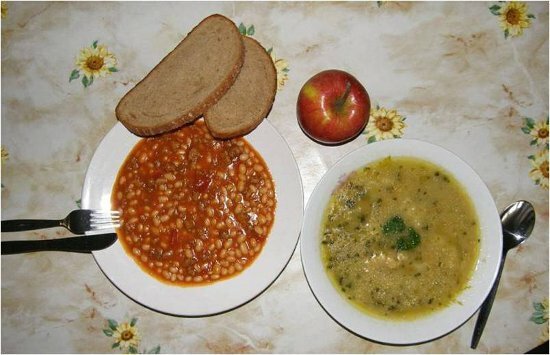 Contents: Pea soup, beans with tomato sauce, an apple, and two slices of typical Czech wheat and rye bread. Notes: At first I thought, gross, beans with tomatoe sauce. But then I thought, well, that's all baked beans and chili are. Wonder what it tastes like? Here in the UK baked beans in tomato sauce is the most popular variety. They're delicious, although if the beans in this picture are the same as the ones we have here, they are probably not the most suitable lunch for a child because they are very high in salt. It's strange that you're unfamiliar with baked beans in tomato sauce, as the most popular brand here is Heinz. The soup looks really tasty... and I love rye bread! :) Great idea for a blog btw.